How Colonel Henry King Burgwyn Lost His Life. 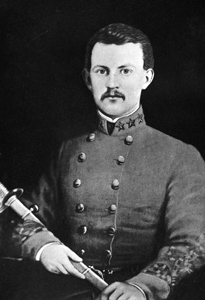 The presence at Raleigh, N.C., of Colonel William H. S. Burgwyn, of Northampton County, who delivered the memorial address of May 10, called attention to the fate of his brother, Colonel Henry King Burgwyn, the gallant young commander of the Twenty-sixth North Carolina Infantry, who lost his life at Gettysburg. It happened among the Confederate veterans who attended the Memorial Day exercises was William M. Cheek, of Lundley, Chatham county, who was a private in Company E of the Twenty-sixth Regiment, and who saw Colonel Burgwyn when the latter was shot. Mr. Cheek said: "It was in the first day's fight at Gettysburg. Our regiment had been formed in line of battle and advanced a considerable distance towards the Federals lines. Our colors were very prominent in the center. Time after time they were shot down by the hot fire of infantry and artillery, and in all they fell fifteen times, sometimes the staff being broken and sometimes a color-bearer being shot down. "The color-sergeant was killed quite early in the advance and then a private of F Company took the flag. He was shot once, but rose and went on, saying, 'Come on, boys!' and as the words left his lips was again shot down, when the flag was taken by Captain McCreary, who was killed a moment or two later. Then Colonel Burgwyn himself took the colors and as we were advancing over the brow of a little hill and he was a few feet in advance of the center of the regiment, he was shot as he partly turned to give an order, a bullet passing through his abdomen. He fell backwards, the regiment continuing its advance, Lieutenant-Colonel John R. Lane taking command and at the same time taking the flag from Colonel Burgwyn. In a moment, it seemed, he was shot, and then Captain W. S. Brewer, of my company, took the flag and carried it through the remainder of the advance, Major John Jones having then assumed command of the regiment. Our regiment was recalled and retired. I was knocked down by the explosion of a shell, which injured my eyesight somewhat, but soon rose and as myself and some comrades went back, I saw Colonel Burgwyn being carried off the field by two soldiers, named Ellington and Staton, who were using one of their blankets for that purpose. "Colonel Burgwyn asked me, whom he recognized as being a member of his command, to help carry him off the field, and I at once gave my aid. We carried him some distance towards the place where our line of battle had been formed, and as we were thus moving him a lieutenant of some South Carolina regiment came up and took hold of the blanket to help us. Colonel Burgwyn did not seem to suffer much, but asked the lieutenant to pour some water on his wound. He was put down upon the ground while the water was poured from canteens upon him. His coat was taken off and I stooped to take his watch, which was held around his neck by a silk cord. As I did so the South Carolina lieutenant seized the watch, broke the cord, put the watch in his pocket and started off with it. I demanded the watch, telling the officer that he should not thus take away the watch of my colonel and that I would kill him as sure as powder would burn, with these words cocking my rifle and taking aim at him. "About that time a shell exploded very near us and took off the entire top of the hat of Captain Brewer, who had joined our party. I left and went to search for one of our litters, in order to place Colonel Burgwyn upon it, so as to carry him more comfortably and conveniently. I found the litter with some difficulty, and as the bearers and myself came up to the spot where Colonel Burgwyn was lying on the ground, we found that he was dying. I sat down and took his hand in my lap. He had very little to say, but I remember that his last words were that he was entirely satisfied with everything, and "The Lord's will be done.' Thus he died, very quietly and resigned. I never saw a braver man than he. He was always cool under fire and knew exactly what to do, and his men were devoted to him. "He was the youngest colonel I ever saw in all my experience as a soldier. If he had lived he would have been given high rank, I feel sure." After Mr. Cheek had given this interesting story, now told for the first time of the fate of his gallant colonel, he was shown and viewed with much [e]motion the sword, sash and gauntlets which Colonel Burgwyn wore during the terrible first day at Gettysburg; that greatest of battles of all the Civil War, which marked what came to be known as the "high-water-mark of the war," and in which the Twenty-sixth Regiment suffered a greater loss than any other regiment, either Federal or Confederate, during the entire four years' struggle. Drawing on Burgwyn's own letters and diary, Davis also offers a fascinating glimpse into North Carolina society during the antebellum period and the American Civil War. From Library Journal: Award-winning historian Gragg offers yet another Civil War title. The 26th North Carolina saw action early in the war at New Bern and Malvern Hill. On the first day at Gettysburg, it fought against the 24th Michigan in McPherson's Woods. On the third and final day, it participated in the infamous Pickett's Charge and suffered an 85 percent casualty rate, the highest of any regiment in the Civil War. Besides recounting the enormous loss of life and the heroic deeds of many men, Gragg reveals the human side of battle. Family diaries and letters describe the difficulties most soldiers faced in coping with military life. The author uses an impressive list of other books and historical sources. What emerges is a detailed but readable history of a regiment whose sacrifices and exploits merit studying. Recommended for its scholarship and depth of coverage to all academic and large public libraries and to special collections. He discusses the shortcomings of Dan Sickles, who advanced against orders on the second day; Oliver Howard, whose Corps broke and was routed on the first day; and Richard Ewell, who decided not to take Culp's Hill on the first night, when that might have been decisive. Sears also makes a strong argument that Lee was not fully in control of his army on the march or in the battle, a view conceived in his gripping narrative of Pickett's Charge, which makes many aspects of that nightmare much clearer than previous studies. A must have for the Civil War buff and anyone remotely interested in American history. President Abraham Lincoln was thankful for the early July battlefield victory, but disappointed that General Meade was unable to surround and crush the Confederates before they found safety on the far side of the Potomac. Exactly what Meade did to try to intercept the fleeing Confederates, and how the Southerners managed to defend their army and ponderous 17-mile long wagon train of wounded until crossing into western Virginia on the early morning of July 14, is the subject of this study. One Continuous Fight draws upon a massive array of documents, letters, diaries, newspaper accounts, and published primary and secondary sources. These long-ignored foundational sources allow the authors, each widely known for their expertise in Civil War cavalry operations, to describe carefully each engagement. The result is a rich and comprehensive study loaded with incisive tactical commentary, new perspectives on the strategic role of the Southern and Northern cavalry, and fresh insights on every engagement, large and small, fought during the retreat. The retreat from Gettysburg was so punctuated with fighting that a soldier felt compelled to describe it as "One Continuous Fight." Until now, few students fully realized the accuracy of that description. Complimented with 18 original maps, dozens of photos, and a complete driving tour with GPS coordinates of the entire retreat, One Continuous Fight is an essential book for every student of the American Civil War in general, and for the student of Gettysburg in particular. About the Authors: Eric J. Wittenberg has written widely on Civil War cavalry operations. His books include Glory Enough for All (2002), The Union Cavalry Comes of Age (2003), and The Battle of Monroe's Crossroads and the Civil War's Final Campaign (2005). He lives in Columbus, Ohio. J. David Petruzzi is the author of several magazine articles on Eastern Theater cavalry operations, conducts tours of cavalry sites of the Gettysburg Campaign, and is the author of the popular "Buford's Boys." A long time student of the Gettysburg Campaign, Michael Nugent is a retired US Army Armored Cavalry Officer and the descendant of a Civil War Cavalry soldier. He has previously written for several military publications. Nugent lives in Wells, Maine. Now, acclaimed historian Noah Andre Trudeau brings the most up-to-date research available to a brilliant, sweeping, and comprehensive history of the battle of Gettysburg that sheds fresh light on virtually every aspect of it. Deftly balancing his own narrative style with revealing firsthand accounts, Trudeau brings this engrossing human tale to life as never before.